PITTSBURGH — This weekend, the Robert Morris Colonials (8-9-1, 7-6-1 AHA) will host the seventh annual Three Rivers Classic. Unlike previous years, however, some games will be held outside the PPG Paints Arena in downtown Pittsburgh. Before the tournament started, the Colonials faced off against the AIC Yellow Jackets (8-8-1, 8-5-1 AHA) in Springfield, Massachusetts. The Colonials lost the first game 4-3, with Luke Lynch, Grant Hebert and Jacob Coleman each netting a goal for the Colonials. In game two of the weekend series, Robert Morris came through with a 3-1 win. Alex Tonge had two goals and Luke Lynch had his second of the weekend. Francis Marotte added 29 saves between the pipes. In the Bears’ most recent game, they beat Army (8-1-0, 7-6-1 AHC) by a score of 5-3. Brown had five different goal scorers in the game: Anea Ferrario, Zach Giuttari, Brent Beaudoin, Joachim Weberg and Trey Dodd. Gavin Nieto made 27 saves in the win. Leading the way for Brown is the young trio of Justin Jallen, a freshman from St. Paul, Minnesota with seven points (5g, 2a); Norwegian sophomore Joachim Weberg, who also has seven points (4g, 3a); and Calgary, Alberta native Tristan Crozier. Crozier has seven points (3g, 4a) on the season as well. The Colonials will handle the Bears in this one, winning by a score of 4-1. Francis Marotte stands tall in net for the Colonials, making 25 saves for his ninth win of the year. In the second game of the Three Rivers Classic, the winner of the Brown/RMU game will play the winner of the game between Union and St. Cloud State (Friday at 5:00 p.m. also at the UPMC Lemieux Sports Complex), at 8:00 p.m. while the losers of the two games will play in a consolation game at 5:00 p.m. Both of the teams that the Colonials could potentially face in the second round are no cake walk, but on the whole, the Union College Dutchmen (9-4-4, 3-4-1 ECACH) seem to be the easier challenge. The Dutchmen are coming off a series against the Canisius Golden Griffins (6-9-2, 5-7-1 AHC), in which they tied the first game 2-2 and won the second 5-3. In the first game, Union had goals from Brandon Estes and Sebastian Vidmar, while in the 5-3 victory, Zachary Emelifeonwu, Brendan Taylor, Michael Ryan, Ryan Walker and Sebastian Vidmar all found the net for the Dutchmen. One of the key players for Union is senior netminder Darion Hansen. In nine games this year, the 6’3” sophomore posts a 2.07 goals against average and a .934 save percentage, both of which are top 20 in the NCAA. Although it is the lesser of two evils in the second round, Union is no slouch, and I think that Union is able to pull out a 3-2 win, and John Adams, a right winger drafted in 2017 by the Detroit Red Wings, gets the game-winner for the Dutchmen. One of, if not the toughest team on the Colonials schedule this year is the St. Cloud State Huskies (13-1-2, 6-0-2 NCHC). The Huskies are currently the top-ranked team in the nation and have not lost a regular season game since October 27 when Northeastern University (12-3-1, 6-1-1 Hockey East) defeated them by a score of 3-2. In the Huskies latest game, they lost 6-4 in an exhibition game to the United States U18 National Team Development Program. Kevin Fitzgerald, Jack Ahcan, Patrick Newell and Brendan Bushy each found the net for St. Cloud. Thankfully not playing for the Huskies this weekend will be the former 25th overall draft choice by the Montréal Canadiens, Ryan Poehling, who has 17 points (3g, 14a) in 16 games this year. Poehling will not be able to play this weekend because he is in British Columbia playing for the United States in the World Junior Championships. Unfortunately for the Huskies opponents, St. Cloud State has more than enough game-changers, including goalie Dávid Hrenák, a fifth-round draft pick last year by the Los Angeles Kings. Hrenák has a 1.81 goals against average and a .919 save percentage through 11 games this year. If the Colonials end up facing off against St. Cloud, it will not be a close game. The Huskies have too much firepower coming from too many areas for the Colonials to be able to stop. I generously predict that the Huskies will win this game by a score of 7-1. 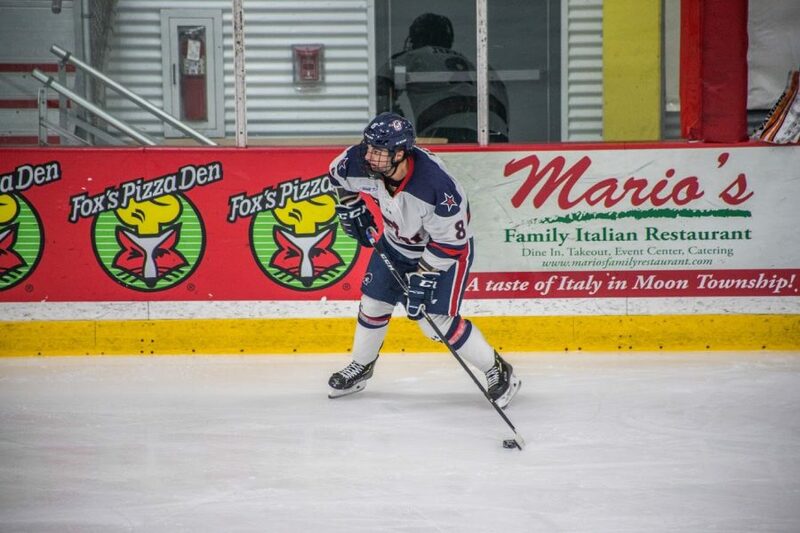 Alex Tonge (RMU): In order for the Colonials to succeed this weekend, their best players will need to play their best hockey, and Alex Tonge is one of those. The senior has 18 points (9g, 9a) in 17 games and leads the team in both goals and points. Joachim Weberg (Brown): The Norwegian sophomore currently has seven points (4g, 3a) for the Bears this year. Weberg has also has been one of their most disciplined players. He is one of only four Bears with zero penalty minutes and more than ten games played this year. Darion Hansen (Union): In nine games this year, the 6’3” sophomore posts a 2.07 goals against average and a .934 save percentage, both of which are top 20 in the NCAA. Dávid Hrenák (St. Cloud State): Hrenák, a 5th round draft pick last year by the Los Angeles Kings, is a key goalie for the Huskies and in 11 games this year, he has a 1.81 goals against average and a .919 save percentage. Patrick Newell (St. Cloud State): As the leading scorer for the number one team in the nation, there is a lot of pressure on Newell, who has performed admirably. The senior from Thousand Oaks, California has 20 points (10g, 10a) this year and shows no signs of slowing down.